Complete arrows made up specially for you to your quoted requirements. These are special order items and orders cannot be cancelled, exchanged or returned once we have started making them. If at all possible we do not recommend buying ACE, ACC, ACG Navigator or X10 arrows over the internet, these are specialist items hence the reason we offer our carbon arrow by trial service*. 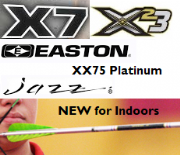 In store we can also custom build arrows to your specification, supplying the full range of accessories including tungsten points, Beiter nocks, Spin Wings wraps - call, email or pop in to get a quote.